For the past few years, I’ve used Brahms’ ever-popular Intermezzo in A major Op.118 No.2 in my Theory III course as a kind of preparation for writing final analysis papers, and for good reason—it’s tightly-knit structure makes it ideal for motivic analysis, it provides great examples of chromatic harmony (plenty of secondary chords, mode mixture chords, and even “simultaneities”), but most importantly, it’s undeniably gorgeous and students, I find, become quickly attached to it. The easy answer, the one I’ve always reverted to, is that he wanted to avoid those pesky double-sharps, making it easier for the pianist to read. But is this really a satisfactory answer? I think not. One might argue that reading the resulting augmented and diminished melodic intervals is just as awkward as reading double-sharps, not to mention the awkwardness of seeing so many flats in juxtaposition with so many sharps. Also, while it’s true that the key of A# minor (seven sharps) is perhaps a bit more cumbersome than Bb minor (five flats), this is only a briefest of tonicizations and not a full modulation. One might understand a composer switching to an easier spelling for an extended passage, but for two chords?? I thought perhaps the F major chord might be referring to something else in the piece. From the home key of A major, F major is flat-VI, a good example of mode mixture, and mixture plays a big role is defining the Intermezzo’s overall character. An F major chord does appear in measures 20 to 21, but making a case that the m.60 F chord is referring to these measure seems a stretch. I wanted to see if there were instances of this kind of seemingly-arbitrary enharmonic respelling in other late Brahms piano works. The first passage that caught my eye is a very similar kind of passage in the very next piece in the Op.118 set–the Ballade in G minor. The central section of the piece finds its way to the chromatic mediant key of B major (via a wonderful non-resolution of a V7/iv in mm.38-40). The B major section sets out but soon modulates to d# minor (via a reinterpretation of a V7/IV chord as a German +6 chord), a key which requires the use of numerous double-sharps. Listen here. It’s true that switching from d# minor (6 sharps) to eb minor (6 flats) does not lessen the number of accidentals, at least it shows that Brahms had no phobia against double-sharps! Then I remembered two passages from second Intermezzo from the Op.117 set. First, measures 4 to 11. Listen here. So as interesting as this passage is, it sheds no light on the Op.118/2 passage containing enharmonic spellings, a passage driven not by voice-leading but by harmonic progression . Let’s move to the other fascinating passage in this Op.117/2 Intermezzo. Measures 20 to 23. Listen here. In the somewhat tonally-ambiguous measures immediately preceding these, a low Db in the bass serves as a dominant orienting this brief passage in the key of Gb minor(! ), which would have as its key signature (count ’em) 9 flats. Respelling these measures as F# minor (3 sharps) would result in 6 fewer accidentals! Yet, Brahms keeps the Gb minor spelling. 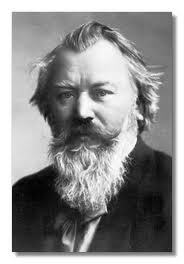 If one suggests that the VI chord would have to be spelled as an E double-flat major chord (rather than as the less cumbersome D major) in order for it to function as the Neapolitan in the oncoming key of Db major (which it does), let’s remember that such a consideration of function did not prevent Brahms from spelling A# minor’s functioning dominant as F major in Op.118/2. Therefore, it seems this passage provides us with an example counter to the one discussed in class. Explaining the Op.118/2 respellings as being done “for ease of reading” seems less convincing. 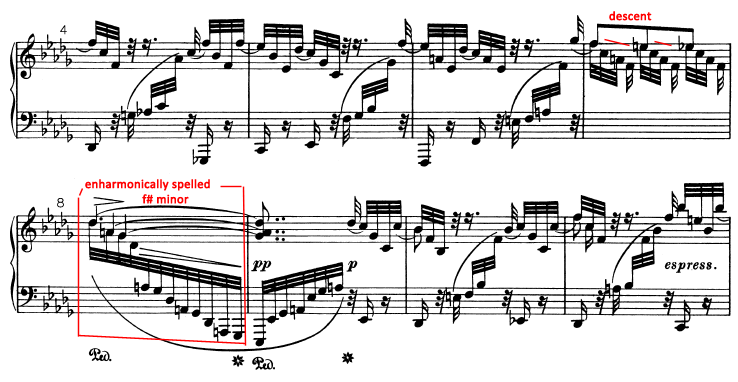 This entry was posted in Uncategorized and tagged analysis, Brahms, enharmonic spellings. Bookmark the permalink. just a guess…but I doubt its an arbitrary thing. I don’t think he used Equal Temperament…so to him enharmonics were not the “same note”. They still aren’t. In this sense F makes more sense than E# by a long shot. The other guess would be a copyist changed the spelling. Ives was famous for scolding them not to “correct” his accidentals. But these guys knew what they were doing.